Measurement Rentals introduces the new Keysight (Agilent) N9342C HSA spectrum analysers to their extensive test and measurement equipment rental range. 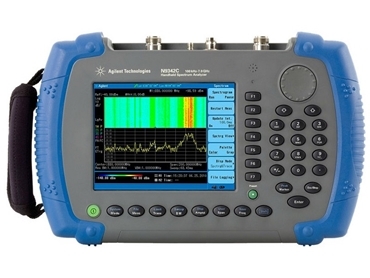 Keysight’s new high performance handheld spectrum analyser (Agilent HSA) covers the 100kHz to 7GHz range with pre-amplifier and spectrogram spectrum recording capabilities. Key features include AM/FM modulation analysis and audio demodulation; USB power sensor support for accurate RF and microwave power measurements with built-in strip-chart recording up to 24 GHz; daylight-viewable colour display; storage of screen/trace results onto USB memory stick; 4 hours of continuous operation with recharge on the fly; and accurate spectrum analysis and field strength measurements. Keysight’s HSA RF spectrum analyser also features a built-in GPS receiver and internal antenna (external antenna can also be connected) and in-built RF spectrum data logging. The spectrum analyser is especially suited to site surveys, drive test and similar measurement applications. No PC is required while data logging, making the instrument ideal for mobile operation, powered from a vehicle's cigarette lighter socket. The Channel Scanner option performs fully automated RF site surveys and drive test, recording signal strength, GPS position, time and date for up to 20 channels as the user drives around. The user can also save as .CSV or .KML files for opening directly in Google Earth for a colour-coded map of received signal strength for each channel. Keysight’s HSA RF spectrum analysers are ideal for RF coverage maps from radio base stations, trunked radio repeater networks and cellular phone towers among others. Measurement Rentals also offers AC power analysers, various DC power supplies, RF power meters, RF spectrum analysers, RF network analysers, digital oscilloscopes (CRO), data acquisition, telecommunications and data communications test equipment, fibre test equipment, audio and acoustic measurement, antennas and a wide range of specialist test and measurement equipment for immediate hire, Australia-wide.